Claude Farrar was born in early 1892 the second son of Wakefield born labourer Henry Farrar and, his second wife, Charlotte Schofield. Claude was baptised at Wakefield St Andrews Church on the 22nd July 1892. Sadly, Henry died in March 1892, shortly before Claude’s birth leaving Charlotte a widow with two young children. At that time the family were living at Bailey’s Buildings, Kirkhamgate, Wakefield, but subsequent records indicate that Claude was born in nearby Gawthorpe and perhaps Charlotte was with friends or relations there at the time of Claude’s birth. By 1895, Charlotte was living at Mill Bank, Thornhill as the wife of George Turner. The couple subsequently had a child, George, and Claude with his older brother, Harry, were also living in the household. By 190l all of the children had the surname Turner. In 1911, Claude then 19 years of age was working as a miner and calling himself Farrar. He and his half brother George Turner, were living at Oak Street, Heckmondwike with George Atkinson and his wife and family. Both Claude and George were recorded as George Atkinson’s adopted sons. George and Charlotte Turner both died in the early 1900s in the Dewsbury area, which would account for Claude and George being referred to as 'adopted'. Claude Farrar’s Army service record has not survived, but it is known that he enlisted at Dewsbury and joined the 12th Battalion King’s Own Yorkshire Light Infantry with regimental service number 12/1006. He died of his wounds on 28 April 1918 and was posthumously awarded the British and Victory medals, but not the 1914/15 Star, indicating that he did not serve overseas before the 31st December 1915. Despite her apparent death in 1903, the Commonwealth War Graves Commission recorded Claude’s mother Charlotte’s address as Double Socks, Thornhill Yorkshire and she was described as Charlotte Turner (formerly Farrar). The history of the 12th Service Battalion (Miners)(Pioneers) King's Own Yorkshire Light Infantry dates from the 5th September 1914 when the War Office authorised the West Yorkshire Coalowners Association to raise a Miners Battalion for the King's Own (Yorkshire Light Infantry). After beginning its life at Leeds, the battalion trained first at Farnley Park, Otley and then at Burton Leonard, near Ripon. By this time it had been allocated to 31st Division as its pioneer battalion. After completing its training in Yorkshire, the battalion moved to Fovant, Salisbury in October 1915 before embarking for Egypt on 6th December. After little more than two months in Egypt, the 12th K.O.Y.L.I. was ordered to France to take part in the planned summer offensive on the Somme. Between 1 July and 30 November 1917, they were attached to Fifth Army Troops for work on light railways. On the 30th November 1917, they returned to the 31st Division as a Pioneer Battalion. Private Claude Farrar was most probably fatally injured on or around the 13th April 1918 in the desperate defence of the Nieppe Forest, part of the Battle of Hazebrouck when the 4th Guards Brigade with 12/KOYLI (attached pioneers of the 31st Division) took the worst of a prolonged German assault. 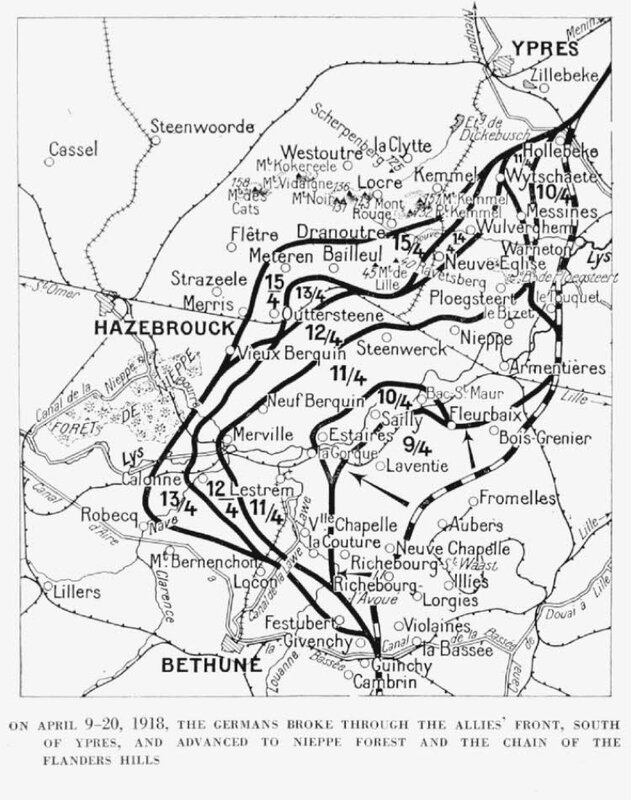 At the height of the fighting, the greater part of three German Divisions attacked the 4,000 yard front held by 4th Guards and adjacent units. After sustaining his injuries, Private Farrar will have been moved to a hospital in Boulogne where he later died on the 28th April 1918 from his injuries. Claude Farrar, also known as Claude Mitchell and Claude Turner was born in Gawthorpe, but appears to have spent little of his complicated life there. This is likely to be the reason why he is not remembered on any Ossett Memorial or Roll of Honour. He is remembered in this 2014 biography and Roll of Honour because the Commonwealth War Graves Commission and/or the U.K. Soldiers who Died in the Great War 1914-1918 listing records him as born or residing in Ossett. Private Claude Farrar, son of Charlotte Turner (formerly Farrar), of Double Socks, Thornhill, Yorkshire, died aged 29 years on the 28th April 1918 and is buried at grave reference IX. A. 38 at the Boulogne Eastern Cemetery,1 Pas de Calais, France. Boulogne-sur-Mer is a large Channel port. Boulogne Eastern Cemetery, one of the town cemeteries, lies in the district of St Martin Boulogne, just beyond the eastern (Chateau) corner of the Citadel (Haute-Ville). The cemetery is a large civil cemetery, split in two by the Rue de Dringhen, just south of the main road (RN42) to St Omer. The Commonwealth War Graves plot is located down the western edge of the southern section of the cemetery, with an entrance in the Rue de Dringhen. Unusually, the headstones are laid flat in this cemetery. This is due to the sandy soil. Until June 1918, the dead from the hospitals at Boulogne itself were buried in the Cimetiere de L'Est, one of the town cemeteries, the Commonwealth graves forming a long, narrow strip along the right hand edge of the cemetery. In the spring of 1918, it was found that space was running short in the Eastern Cemetery in spite of repeated extensions to the south, and the site of the new cemetery at Terlincthun was chosen. Boulogne Eastern Cemetery contains 5,577 Commonwealth burials of the First World War.